GRUB stands for GRand Unifier Bootloader, to get it on your system you must install package grub or grub2, GRUB is the replacement for largely used but unscalable LILO (LInux LOader) and alternative for SILO (Solaris Improved Bootloader). The BIOS searches for a start (bootable, flag B on partition table) then passes the control to the MBR (Master Boot Record) which is a 512 bytes area of the (bootable) hard disk (or other device) and is part of the stage 1 of GRUB. The stage 1 of GRUB loads the next stage of GRUB located phisically in any part the harddisk (or other device). This stage can load the stage 1.5 or 2. The stage 1.5 of GRUB located in the next 30 kbytes of the harddisk loads the stage 2. In GRUB version 2 this stage is gone!!!. Finally, GRUB load the compiled kernel image selected by the user in the memory and pass the control to it. Use at least an overall password for each server. Don't allow auto boot for securing and monitoring reasons (it could be a headache if you don't in site support). Install GRUB in MBR of hd0 (first harddisk). After modification you must execute update-grub or grub-install /dev/sda. You can generate and overall password or on a per menu entry basis for menu edition, booting and other task in a userless way, using the grub-md5-crypt to generate password hashes. 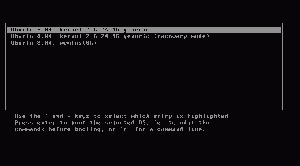 The grub.cfg file is autorecreated when running grub-mkconfig after all modifications. After running grub-mkconfig you must run grub-install /dev/sda.